This issue of Utsav Trends promises to be a blockbuster in itself. As Bollywood continues to influence closets, we bring you the maestro Sanjay Leela Bhansali’s style sensibilities as portrayed in his films. Feast your senses on the beauty of Bandhani, the magnificence of Jacket style Abayas, the elegance of Bengal Handlooms, and so much more. Let the show begin! Her regal beauty changed destinies! Bhansali's Rani of Chittor is resplendent in Rajasthan's most cherished finery. Bring out your inner queen with the finest of Gota work ensembles, Block print skirts and colorful Lehariya prints. Don Mulmuls, Chanderi Silks and Kota attires to conquer hearts. The colorful exuberance of Gujarat comes alive in Bhansali's Ram Leela. Remember Deepika swirling in her layered Ghagra Cholis? Come, behold our collection of Patchwork beauties, Bandhani stunners and Bright-hued lovelies sprayed with contrasting hues, mirrors, threads et al. Aishwarya as Nandini in Hum Dil De Chuke Sanam was poetry in motion. Taking a cue from her mind-numbing Lehenga Cholis and Sarees, we bring you sublime Mirror work attires in vibrant hues. Look dreamy in lovely Net attires and elegant Monotone Sarees in wistful shades. 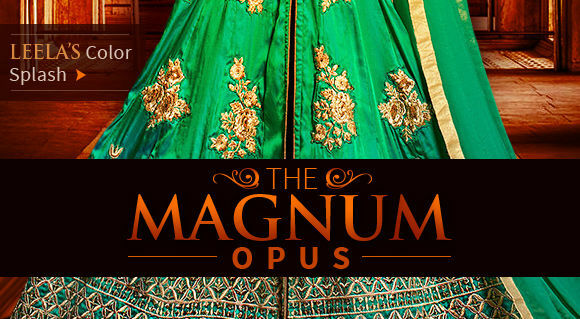 From the rebellious Mastani and imperious Kashibai came a spectacular line of fashion. Impress your Bajirao in gossamer Chanderi Silk attires in deep, saturated colors, flowing Anarkalis with delicate embroidery in Georgette as well as Jacket style Lehenga Cholis. Look so regal. For a close brush with Bengal's aristocracy, there is Devdas. This epic tale of color and texture is woven into our beautiful handloom Tant Sarees with red borders and gorgeous pallus. You can also recreate Chandramukhi's vivacity in Embellished Lehenga Cholis.